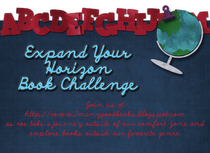 This challenge is pretty flexible – choose the number of genres you would like to read. My goal is 12 books from the genres listed below. This challenge is all about re-reading books. I don’t reread very often, if ever, so I’m looking forward to an excuse to relive the adventures of old books. I will be choosing the Scholar Level – reading 4-6 books evenly through the mini-challenge categories below. 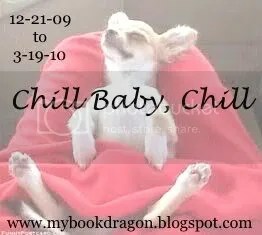 The Chill Baby, Chill Challenge runs from 12/21/09 through 3/19/10 and is being hosted by Book Dragon at Book Dragon’s Lair. The rules are extremely easy…just read 6 books…they can be anything you want…other challenge books, new books, TBR books, etc. You don’t have to list them early. If you review your books…post a link in the comment section. Then do a wrap-up post in March. That’s all there is to it!! This challenge seemed pretty simple and it’s always good to have an easy one mixed in. Since I joined late, I will only count books started on or after December 31, 2009. 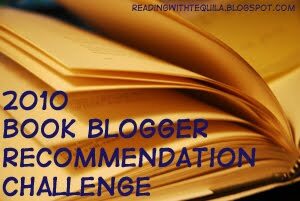 Reading with Tequila created this great challenge where she had bloggers recommend books then created a large list from 2009. Click here to see the entire 2009 Book Blogger Recommendation List. 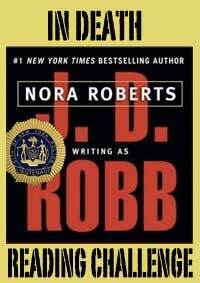 I am choosing Level IV – Read 20 books. This way I have at least 2 alternatives – and who knows if I might choose something else on the list not mentioned above. You can find all the details HERE. I’m hoping to join in and complete the 12 hours if not more. I already have a lot of mysteries on my list so this way I can knock quite a few of the Stephanie Plum, Women’s Murder Club, and In Death series books off the list early. List of books to be read coming soon. Read one In Death book per month and make a post about it on your blog. It can be a review or just commentary, if you like. Please, please, PLEASE indicate somewhere at the beginning of your post whether or not your post includes spoilers in order to protect innocent eyes. It would also be great if you’d link back to this post in your monthly posts. Make your post on the last day of the month. This is for my benefit because I’m really awful at Reading Challenges and I need as much time as possible to procrastinate. I try to remember to do a reminder post one week before. The year is almost over. I have today and tomorrow to finish any books for challenges and my hope is to finish all three I am currently reading before that. Good think the New Years Read-a-Thon kicks off tomorrow at 5pm. Then as soon as midnight hits I am sinking into the good comfort reads I have been dying to get to for some time.